though jamie and i tried our best to avoid any tourist-trap locales, we couldn’t resist the historic coit tower. the view from the tower was stunning, but the line was quite long and there is a small fee to enter. we enjoyed the walk up telegraph hill more than the tower itself. so, if you don’t have enough time to go into coit tower, i suggest at least taking the stairs up the hill. 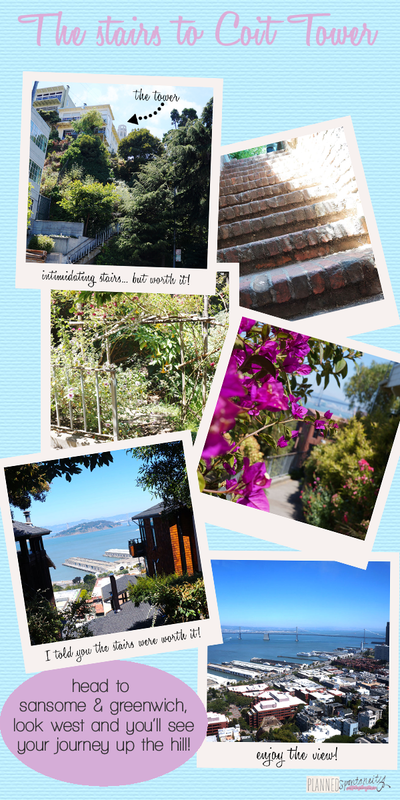 walking up over 300 stairs may sound exhausting, but the views of the bay and the beautiful gardens along the way are worth it. my best directions: head to sansome & greenwich, then head west. you’ll see the stairs, I promise. OOOouu! amazing! i wish I could be there!! !